There is an ominous passage in Tony Judt’s Postwar that’s stayed with me ever since I first read it. It starts on page 27 in my edition, and since it’s near the beginning you can read the whole excerpt on Amazon if you want. Alternatively, you can buy the entire book on Kindle for $1.99, which is certainly one of the great bargains of all time. 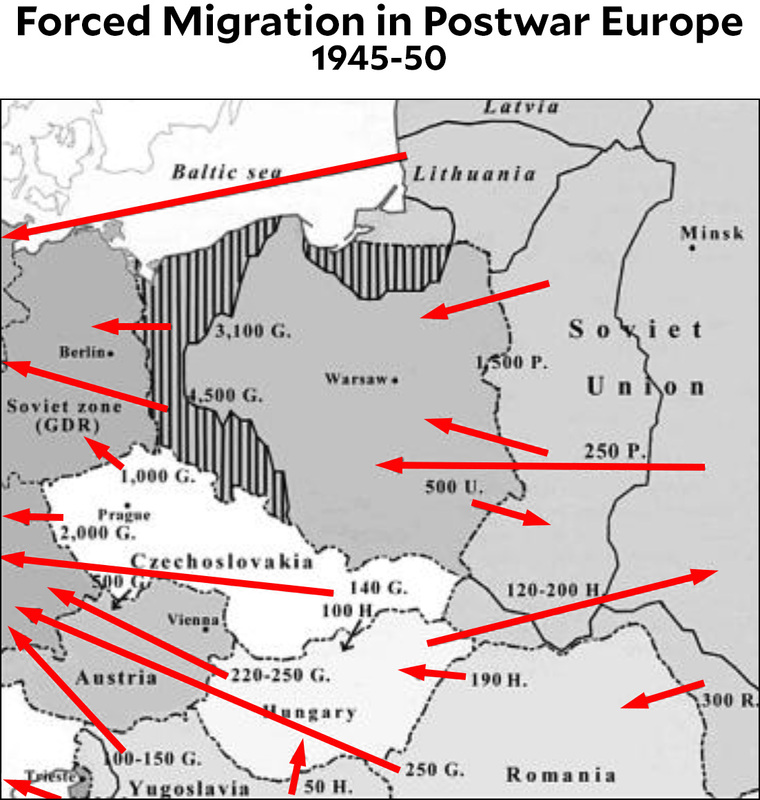 With one major exception [Poland] boundaries stayed broadly intact and people were moved instead….Western policymakers…acquiesced readily enough in the population transfers. If the surviving minorities of central and eastern Europe could not be afforded effective international protection, then it was as well that they be dispatched to more accommodating locations. The term “ethnic cleansing” did not yet exist, but the reality surely did—and it was far from arousing disapproval or embarrassment. ….With certain exceptions, the outcome was a Europe of nation states more ethnically homogenous than ever before….Poland, whose population was 68 percent Polish in 1938, was overwhelmingly populated by Poles in 1946. Germany was nearly all German…Czechoslovakia…was now almost exclusively Czech and Slovak….The ancient diasporas of Europe—Greeks and Turks in the south Balkans and around the Black Sea, Italians in Dalmatia, Hungarians in Transylvania and the north Balkans, Poles in Volhynia (Ukraine), Lithuania and the Bukovina, Germans from the Baltic to the Black Sea, from the Rhine to the Volga, and Jews everywhere—shriveled and disappeared. A new, “tidier” Europe was being born. The main exception to this was Yugoslavia, which nonetheless survived peacefully under Tito’s autocratic rule but promptly became increasingly strained after his death and then turned into a bloodbath during the following decade. For the rest of Europe, the descent into hatred and bigotry has been slower and less dramatic, but no less real. As the “tidier” Europe invented after the war became less tidy, native populations once again became more restless and right-wing nationalist parties grew more powerful. This change has been noticeable for decades, but it was the migrant crisis of 2015 that finally tipped things back over the edge. Just as it was before the war, the problem of ethnic tribalism is worse in poorer, less traditionally democratic eastern Europe—in countries like Hungary and Poland—but it’s migrated as well to France, Austria, the Netherlands, and, most famously, Great Britain. My aim here is modest: I mostly just want to highlight Judt’s unsparing review of postwar Europe’s solution to endless war. None of this means that Europe is hopelessly ethnocentric, or that perhaps the problem of burgeoning migration across borders should have been taken a little more seriously back in the 80s and 90s. There was, after all, every hope that things had become more civilized by the end of the 20th century. But in the same way that America has made progress against racism but is far from erasing it, it turns out that Europe is farther from erasing its own tribal past than it had hoped. If ethnic cleansing really did play a role in Europe’s unusually peaceful postwar decades, it’s perhaps not too surprising that the spirit of ethnic cleansing is on the menu again.